Gripper Rotary Unit holds very small components. Used in production and assembly of very small components, miniaturized RP gripper rotary unit is comprised of RM rotary module with MPG-based pneumatic parallel gripper. Rotary module sizes 08 and 10 can be combined with gripper sizes 12, 16, and 20, and gripper can also be equipped with 2 types of ID or OD gripping force safety devices. Angle of rotation is 190Â°, end position accuracy reaches Â±0.05Â°, and drive torque is 0.107 Nm (RM 08) or 0.224 Nm (RM10). The new miniaturised RP gripper rotary unit from SCHUNK is designed for applications in the production and assembly of minuscule components. It is made up of a combination of the RM rotary module with a pneumatic parallel gripper based on the MPG. The rotary module sizes 08 and 10 can be combined with gripper sizes 12, 16 and 20 to form four different sizes of RP gripping rotary unit. Since the gripper can also be equipped with two different types of I.D or O.D. gripping force safety device, a total of ten variants of the RP gripping rotary unit are now available to the user. The parallel grippers are based on the MPG grippers, but the drive has been modified with a longer piston rod in order to operate it on the rotary module. The RM rotary modules operate according to the rack and pinion principle, they are equipped with hydraulic shock absorbers and the angle of rotation can be adjusted steplessly over the entire field of rotation. The double piston action guarantees end positions free of backlash and a high repeat accuracy. Through its modular design and the center bore the RM series is prepared for the set-up of gripper rotary modules without rotating power cables. The end positions are monitored by integrated sensor sets. Since the RM rotation modules have a standardised hole pattern, with the corresponding adapter plates they are compatible to many Gemotec system modules. 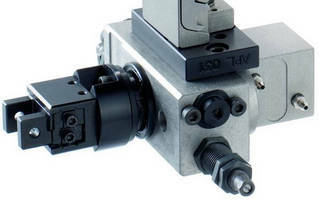 They can therefore be combined both with each other and with other system modules from the Schunk - ideal prerequisites for combining them with linear units, for instance, thus putting together modules from the module program such as pick-and-place units, gantry systems or complete function modules. The angle of rotation of the mini rotation modules is 190 ° the end position accuracy reaches +/- 0.05°. The drive torque is 0.107 Nm (RM 08) or 0.224 Nm (RM10).